State Bank of India is going to conduct Specialist Officer Exam Very soon. There will have huge competition for the Bank Jobs in India for that candidates have to start preparation immediately. Applicants who have applied for the SBI SO Exam they are searching for the SBI SO Syllabus 2019 and Exam Pattern. 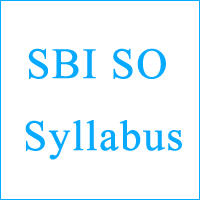 Here we have given the SBI Specialist Officer Syllabus and Test Pattern which is Useful to your Preparation. Aspirants can also download State Bank of India SO Exam Syllabus through direct link provided below. Check furthermore details regarding the Bank Exam Syllabus and Test Pattern at the official website. State Bank of India Planning to release the Recruitment notification to fill Specialist Officer vacancies. Job hunters who are hunting for the Bank Jobs can use this information. Interested and Eligible Aspirants may Apply for SBI SO Jobs 2019 before the Last date. Furthermore details regarding the SBI SO Recruitment 2019 by clicking on the below link. On this page, you can find the SBI Specialist Officer Syllabus. Applicants will finalize for Specialist Officer Posts based on the based on the Following tests. The questions will be Hindi & English. The SBI SO Exam Consists 170 Questions. The Exam conducted for 220 marks. Negative Marking – 0.25 will be deducted for each wrong answer. Here we have provided the detailed State Bank Of India Specialist Officer Recruitment 2019 Exam Pattern for the Candidates who are appearing the Exam. Basic Programming Languages (C, C++, Java). Basic concepts of Software and Hardware. Ethics and Corporate Governance in Banking. Security Types and Regulatory Frameworks etc. Name of the Bank: State Bank Of India.